Today starts my 18 week journey to my 3rd PhiladelphiaMarathon ! The past 2 years, I have done a Liberman plan, and while it has been effective, I think it is time to change things up a bit. My goal is a fall 2011 attempt at a BQ time. This year I would need to run a 3:20 marathon, and that's just not going to happen. Next year, I move up to the 45-49 age group, and would need a 3:30. So, the plan this year is to knock 10mins off my time, and hit a 3:40, so next fall I would only be 10mins away. I think it's asking too much to drop 20mins at once. SO with a 2011 BQ my goal, I have done some research, and have chosen Uncle Hal, and his AdvancedI plan! He spells out everyday a plan/goal to accomplish, and I like the added hills & speed work. I think that will be a huge benefit come Nov. The past 2 years, I have logged miles, and not much else. The only thing that might throw a monkey wrench into my 3:40 or bust plan, is this little race held in NYC on the 1st Sunday in Nov. I still have a shot at running it, with a charity. 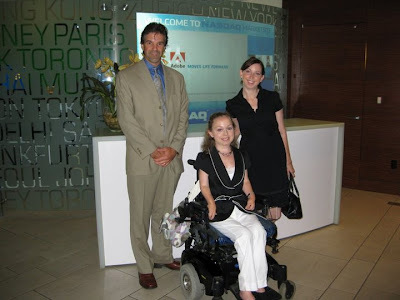 I have tried to raise awareness & money for ANRF, and was asked to go to NYC with them to the opening of NASDAQ. While I was there, one of the board members was asking me to run the marathon for the foundation. While I am all for running it, $2500.00 is a lot of money to raise. I'll know more in the next week or so, if I am in or not. If I do run it, that will be 2 marathons in less than 16 days, and would make me MarathonManiac eligible! So day one is in the books, and 18 more weeks to go!